Blades: Mostly flat, slender, 6 to 20 inches long, to 1/3 inch wide, yellowish green, rough above, midrib prominent; tips tapered to points. Sheaths: Overlapping, glabrous, collar with tufts of hairs. Ligules: Inconspicuous rings of short hairs. Inflorescences: Panicles, open, much-branched, 14 to 22 inches long, 3 to 12 inches wide, often about 1/2 height of plant, purplish or reddish; branches slender, erect or ascending; branch axils sparsely hairy. Spikelets: Numerous, long-stalked, 3-13-flowered, less than 1/2 inch long, to 1/6 inch wide, pale purplish; awns absent; glumes and lemmas sharp pointed. Habitat: Prairies, open woods, and disturbed areas, in sandy soils. 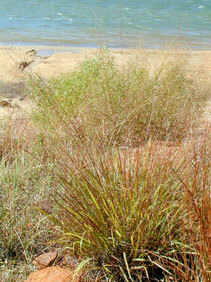 Forage Value: Sand lovegrass provides excellent forage for livestock. It is sometimes called "ice cream grass" due to its high palatability. Comments: Sand lovegrass is strongly tufted and has a deep, dense root system. It decreases under intense grazing.